“Frances Ha” (2012 production, 2013 release). Cast: Greta Gerwig, Mickey Sumner, Adam Driver, Michael Zegen, Charlotte d’Amboise, Grace Gummer, Patrick Heusinger, Michael Esper, Christine Gerwig, Gordon Gerwig, Maya Kazan. Director: Noah Baumbach. Screenplay: Noah Baumbach and Greta Gerwig. Web site. Trailer. In fact, about the only thing to which each of them is committed is their friendship, but, when that sours, they’re each suddenly more adrift than ever. Frances moves in with Lev (Adam Driver), a sculptor’s assistant, and Benji (Michael Zegen), an aspiring movie and TV writer, both of whom seem to be able to make their dreams happen (or at least to convincingly convey the impression that they do). Before long, though, Frances finds herself directionless once again. When Colleen (Charlotte d’Amboise), Frances’s dance company director, releases her from her apprenticeship, she looks for something – anything – to latch onto. She floats from tangent to tangent, taking time to visit her parents (Christine Gerwig, Gordon Gerwig) in her hometown of Sacramento, spending time with fellow dancer Rachel (Grace Gummer), embarking on an impromptu weekend trip to Paris, and returning to her college to work as a residential advisor and reception server. But none of these adventures provides her with the answers she seeks. The looming question for Frances thus becomes, “Will she ever find her way?” Or is she forever doomed to wander the creative wastelands? Indeed, can she find the focus she needs to succeed, or will she wind up being yet another failed artist who never lives up to her potential? In the end, it all comes down to what she does to make it, or not make it, happen. It’s easy to see what Frances needs to do to turn things around – very simply, she needs to settle down and grow up. If she ever wants to get to where she wants to be, she needs to take responsibility for her creations. But that involves more than just “acting responsibly”; it requires her to get in touch with the beliefs she employs in manifesting the reality she experiences. This may be a little easier said than done, but it’s certainly not impossible if she sets her mind to it. For instance, Frances truly needs to clear out the clutter clogging up her consciousness. She needs to rid herself of superfluous beliefs and focus on the core, essential notions that she draws upon for shaping the existence she materializes. In particular, she needs to wipe away the beliefs related to the many distractions she ends up manifesting, for they take away her focus and detract from the primary aims she hopes to achieve. It’s certainly nice to have good times in one’s life, but, when their pursuit overtakes our primary reason for being, they derail us in our efforts to fulfill our main purpose in life. Frances even recognizes this to a certain degree. While at a dinner party one evening, one of the guests asks her what she does for a living, to which she replies that it’s rather difficult to explain. When the guest follows up by asking if what she does is complicated, Frances responds by saying “No, [it’s hard to explain] because I don’t really do it.” And that about sums up things in a nutshell where Frances is concerned. The deeper question here, then, is “Why does Frances create all of the distractions that keep her from accomplishing her goals and living her dreams?” Is it that she simply doesn’t know how to go about this and just creates diversions to fill up her days in the meantime? Or is it that she’s on the wrong path and needs to find a new one? Or perhaps she’s wrestling with a fear of success issue? No matter what the case, though, if she ever wants to move forward with her life, she’ll need to sort out her beliefs about what she’s doing (or isn’t doing) and why. Distractions, when left unchecked, often can become crutches or excuses for our behavior, both in terms of our daily activities and our conscious creation efforts. Indeed, it can become rather easy to fall back on trumped-up rationalizations for not doing what we could or should be doing, when, in fact, such actions frequently amount to little more than feeble justifications for avoiding more significant issues in our lives. Frances lives much of life spontaneously, and that can be quite beneficial. Spontaneity is often proof that we’re following our intuitive impulses, those strong, powerful messages that frequently provide sage guidance for helping us achieve our conscious creation objectives. And acting upon them is even more important, for they help to transform those intangible thought forms into corporeal manifestations. This is truly a sign that the creative juices are flowing. However, when we only follow the spontaneity associated with the creation of our distractions, we tend to get further afield from our hoped-for expectations, and, sadly, those are the impulses that Frances most often acts upon. Learning how to temper our spontaneity with wisdom and focus is thus crucial if we ever hope to get the most benefit out of it. By continuing to pursue such a course of conduct, the inevitable outcome is most likely going to be hitting rock bottom. At that point, it becomes imperative to clear away the clutter and distractions, because our very survival often depends on it. Such severe circumstances force us into “getting real,” setting aside the excuses, the immature behavior and the time wasting. If we don’t, the results could be disastrous and demoralizing. It’s a realization that Frances had better come to terms with before it’s too late. While the message of “Frances Ha” could benefit anyone in need of getting his or her act together, I believe it’s no accident that the protagonist is a young, upcoming professional in need of imposing some metaphysical and daily living discipline in her life. Contemporaries of the lead character might thus benefit the most from viewing this picture, in large part because they’re the ones most likely to identify with Frances’s circumstances and challenges. To that end, then, I’d heartily recommend this film to the twenty-somethings out there who are looking to find their way and get their lives off the launching pad. Watch and learn from Frances, and don’t be afraid to make some the same mistakes she does (it’s part of one’s learning curve after all); just don’t make a habit of it. “Frances Ha” is a moderately funny and quirky picture reminiscent of some of Woody Allen’s films, such as “Manhattan” (1979), where the characters create needless distractions while attempting to create their true selves. Like other offerings from director Noah Baumbach, this picture is quite effective in its portrayal of characters in search of themselves in the wake of life-changing events. 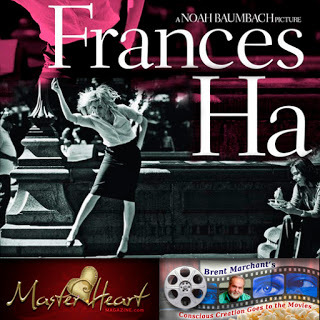 As in “The Squid and the Whale” (2005), where family members struggle to cope with the effects of divorce, and “Greenberg” (2010), where the protagonist attempts to manage his affairs after a mental breakdown, “Frances Ha” depicts the efforts of a character seeking to keep her dreams from slipping away while things slowly but relentlessly fall apart in her life. And, like the characters in the director’s other releases, the protagonist in this film is also the only one who can save herself, provided she’s willing to make the effort to do so. While the picture is generally well written, its laughs are a little more sparse than I’d like. What’s more, the movie is a little too conscious of its own eccentricity at times, taking its hipster chic attitude, either unintentionally or in an act of intentional self-parody, to an annoying level on more than one occasion. That aside, however, the picture is beautifully filmed in black and white, features a great lead performance by Gerwig, and includes a terrific soundtrack with the likes of David Bowie, Paul McCartney, T. Rex, Harry Nilsson and Hot Chocolate. Taking responsibility for our actions, both in our beliefs and what arises from them, might not always be the most fun thing to do, but, if we ever hope to fulfill our dreams, it’s essential, especially when launching new and meaningful undertakings. 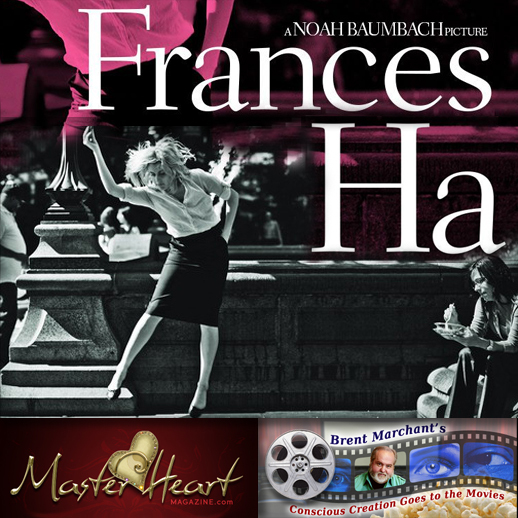 “Frances Ha” provides us with some examples of what to do, and what not to do, as we progress along the path of realizing our dreams. The virtues of such actions are sure to bring ample rewards, especially once we follow through on them to fruition. Now that’s an effort that’s well worth pursuing. Photo courtesy of IFC Films.